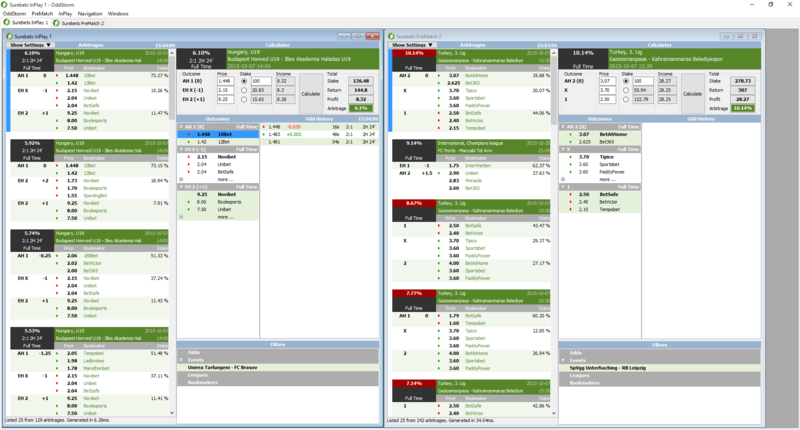 Many people that just came into the world of sports arbitrage business and are not that good and fast enough at navigating through the bookmakers websites, meet one general problem - How to place the bets on time before the arbitrage situation disappear? 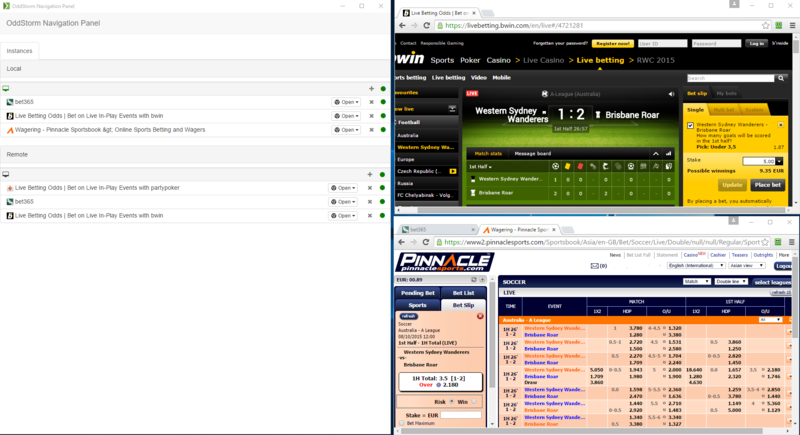 Thanks to the global fastest surebets delivery service - OddStorm this problem is finally solved. They have developed new and unique surebet navigation that leads you directly to the betting event page with a single click and all you have to do is to enter the amount and click "bet". This tool will help win a lot of money and it is perfectly designed for use by amateur and professional sports arbitrage players. It is really that simple as it sounds and if you don't believe it, then make sure by yourself by purchasing a subscription and try it or take a look at the video below and see how simple and easy for use is. 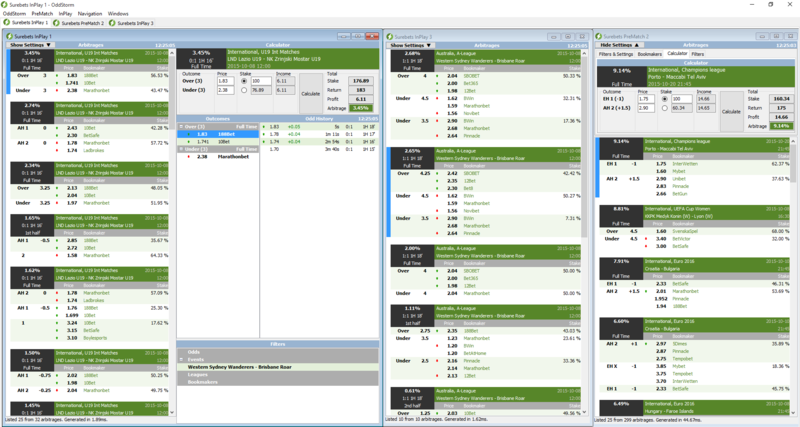 Some of the main supported bookmakers by the surebets autosurf are Bwin, Pinnacle, WhilliamHill, Bet365, PartyPokers, SBObet, Sportingbet, Betfair, Unibet, 188bet, Marathonbet, Youwin, Novibet, Tempobet and 1xbet. Many other bookmakers will be added and if you want to get the complete list with the supported bookmakers just check /OddStorm Bookmakers/ or at the /OddStorm Manual/ in section "Navigation". The navigation is supported only by the Desktop App /download/ (the Web App does not support navigation) and you need to have installed the latest version of Google Chrome. The Desktop App works only on windows Vista, 7, 8, 8.1 and 10. You need to open the Google Chrome browser from the navigation panel as it is shown in the video above, otherwise, it won't navigate you. Some of the bookmakers require special settings to be set in order to navigate sucessfully, so if you are having troubles understanding how it works, please take a look at the OddStorm manual /here/. 1. Choose Navigation->Run from App Menu. It opens two Chrome browsers. Do not close them! 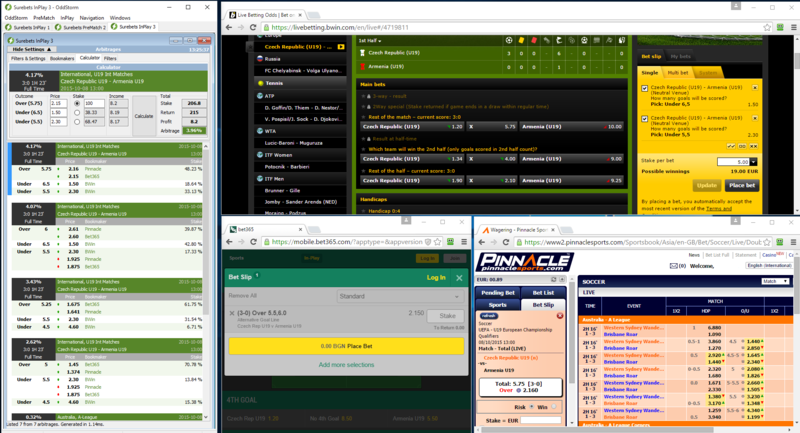 First is Navigation Panel, second Chrome is where bookmakers should be opened and auto-navigated. 2. Chrome instances are run in separate user profiles, which can be later customized by you, e.g. login into Google in order to have your stored credentials available, or installing Chrome plugins by your flavor. 3. After clicking on a surebet from Arbitrage List selected surebet will be put into the Calculator and instruction will be sent to already opened bookmakers to navigate and prepare its betslip. 4. Double-clicking over arbitrage percent located in the Calculator area, instructs rearming the navigated bookmaker's betslips. 5. 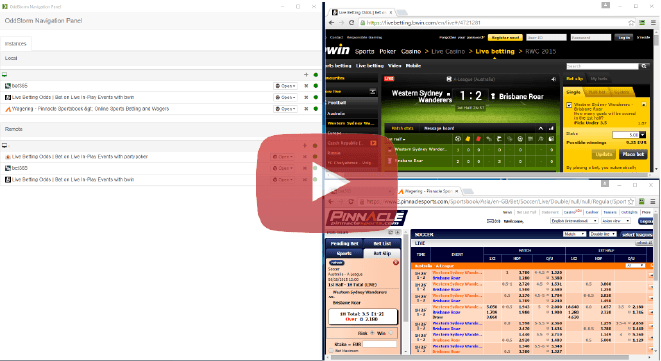 Auto Navigation supports running on several Remote or Virtual Machines and navigating different logged-in bookmakers accounts upon surebet click, but VIP Plus subscription is needed for it. OddStorm surebet navigation is the so long waited solution which will ensure you the best arbing time and will help you to win lots of money for short time. It is fully functional and it worth it for sure! Enjoy it! How to beat the bookies? Take a look at the special settings that need to be made in order to navigate: https://www.arbitrageguides.com/img/manual/pinnacle-1.png You will find such settings for other bookies here: https://www.arbitrageguides.com/oddstorm-manual in section "Navigation"